We had the opportunity of eavesdropping on a frank and wide-ranging conversation about the Anglican Communion recently. We've taken the liberty of disguising names and including only titles, editing some of the remarks to their essence. A Canon of Westminster Abbey: Any attempt to set up a central authority would be doomed to failure. The spirit of the times in which we live is against it. The craving for the voice of authority, and the promised escape from a saturnalia of private opinion, are some of the most potent factors for those who convert to Rome. We're tempted to say, in the words of the Book of Judges, 'In those days there was no king in Israel, but every man did that which was right in his own eyes'. We murmur 'Babel!' and we forget that the Babel of the dispersion was, after all, better than the Babel of united effort. For then they were all agreed, and all spoke the same language — but were all fatally in the wrong. We groan under apparent anarchy, but forget that in the history of the Church there are, and have been, times of experiment. We may very possibly be — we almost certainly are — living in one of those times of experiment, when it would be one of the most fatal mistakes which we could make, to attempt to alter and to fix. And it may well be that such an attempt in a wide and variously constituted body such as the Anglican Communion would be productive of more harm than good. We must also surely be on our guard against anything which would tend to make us forget that the Anglican Communion is not conterminous with the Church. 'I believe in the Holy Catholic Church', not in the Anglican Communion, however great and precious that portion of the Church may be. The Archdeacon of Dunedin: The Church in New Zealand is a voluntary association of members of the Catholic Church in full union and communion, spiritually and ecclesiastically, with the Church of England, but that does not make us, the Church in Australia or South Africa to be the Church of England. Our relationship is a natural one, and it would be a mistake to hamper it by making it depend upon a constitutional basis or by seeking to consolidate it by formal enactment. Any such attempts would weaken rather than cement the existing union. Why turn voluntary bonds into obligatory fetters? Bishop Coadjutor of New Hampshire: There is a great tendency to identify the Anglican Communion with the Church of England. Speaking as an American, it seems to me the best line for the American Church to take at present was to stand rather stiffly in its comparative strength for the position of national Churches. A Canon of St George's Cathedral, Cape Town: The idea of the Anglican Church is to preserve and to proclaim the whole Faith as she has received it and at the same time to learn more and more of the meaning of what God has revealed to man. The Bishop of Gibraltar: We should remember that what we should aim at is not closer union with Canterbury, but closer union with one another. As a matter of fact, there has never been a whisper derogatory to the primacy of honour which belongs to the See of Canterbury as the historic centre of the Anglican Communion. But everything depends upon our real object; and our object surely is not consolidation with Canterbury, but simply a more adequate method of common action for the Churches of the Anglican Communion in the matters that concern all. A Vicar from Yorkshire: The Anglican Communion is primarily that Branch of the Church which is the Church of the Anglo-Saxon race throughout the world. The Dean of Westminster Abbey: The ideal function of the Anglican Communion is to express and guide the spiritual activities and aspirations of the Anglo-Saxon race. Did you wake up at the last two comments? And wonder what world these clergy were living in? Welcome to the world of 1908. These comments are taken from a session on 'What is the Anglican Communion?' at the Pan-Anglican Congress, which opened on Monday, 15 June 1908 and ended on 23 June. It was a worldwide conference of churchmen and women, in which 'six halls were engaged for the meetings daily for eight days. The Albert Hall, two halls at the Church House, the Holborn and Kensington Town Halls. At night meetings and services were held simultaneously in St Paul's, in the Church House, and in one or two other places. All were crammed every day, and it was calculated that some 17,000 people were present each night'. The Church Times noted that the conference's success had even led someone to describe it as 'the greatest Oecumenical Council ever known to history'. 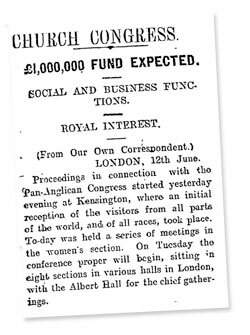 And 'in 19 pages of close print spread over two weeks', the Church Times further 'summarised the debates and meetings on such subjects as marriage, the Church and human society (issues such as “Sweating” and “Christian Science”), capital and labour, religion and science, racial difficulties, monopolies, religions and the press, biblical criticism, aborigines, and Christianity and Socialism'*. At the Thanksgiving Service at St Paul’s Cathedral, a total sum of £333,208 was laid on the altar, roughly an astounding £24,944,757.37 in 2007 UK pounds — or just over $41,000,000 US dollars At ONE SERVICE. Would that be possible now? But even that stupendous Pan-Anglican Congress couldn't sort the question of just what the Anglican Communion is and how it should work. Whether that's comforting or not is open to question. *If you'd like to read the papers and proceedings of the 1908 Congress, the entire report is available in PDF.